So obviously on the return trip home our bags were approximately twice as heavy, as they were stuffed full of board games. I had a copy of Pandemic: The Cure, and inside the box was also a copy of ‘And Then We Held Hands’, and an expansion for Cosmic Encounter. Stuffed inside the box for the Cosmic Encounter expansion was a copy of ‘Saboteur’. And many, many more games. Thanks to a wonderful combination of returning to work and jetlag, we haven’t even gotten to punch out our new treasures yet (hence the return to a familiar game this week). But we’ve cleared our weekend to play as many as we can, starting with the gorgeous looking ‘Above and Below’ – very excited to get stuck into that. As for the comic: this has become a regular, and somewhat worrying trend in our games of Sherlock Holmes: Consulting Detective. Once we arrive at the end, inevitably after long hours of sleuthing, we start well with the questions, only to find that the second set of questions (dealing with trickier details and often entirely separate subplots) flummoxes us. They ask question about people and places we had only seen mentioned in newspapers, and never encountered or investigated. And this inexorably leads to ‘well, we could go back and just have another look around. We did mean to investigate that lead, we just forget…’ I have mixed feelings about this trend. A part of me thinks that once we declare we are done, we are bound to the decision and cannot go back. But another part recognises that we don’t play Sherlock competitively, or even ‘to win’. We play it as a co-op group (entirely the best way to play, by the way) and we always have so much damned fun doing it, that why shouldn’t we take the opportunity to indulge ourselves further? Does anyone else have this dilemma with Sherlock Holmes? Also, does anyone actually play it competitive as opposed to co-op? I’ve done 3 cases now. My instinct with the “scoring” aspect (apart from the fact the Holmes is a cheating douche) is that the secondary questions are not worth the points. The first case I think we got all but 1 of the questions, but used so many clues it nullified it easily. The other two we’ve focused in more on the main case, and haven’t done any worse from a points POV. What I did notice, however, was that we became much less cavalier about diving off to locations randomly, and much more inclined to discussion and between “turn” thinking, so the game hasn’t got any shorter. Also, it’s brilliant. I love it. There is, apparently, an English translation of the expansion in the works for this year. Can’t wait. I actually just realised in our last game that the scoring is probably designed for the ‘competitive’ rules. If you play by those, then each player only chooses a lead on his turn, so in a four player game you would only be responsible for one in four leads when it came to scoring. I think. When you are playing coop, everyone scores together, which might be why the Sherlock is so insanely difficult to beat on the scoring? In any case, while we do keep a track of leads visited, we don’t let it affect how we play. It’s too much fun, and far too intriguing to not chase down every lead -at least until it gets really late and everyone gets tired. Really excited to have more cases as well. This makes sooooo much more sense. Though I agree with Ben about Holmes. And this comic overall is so spot on. 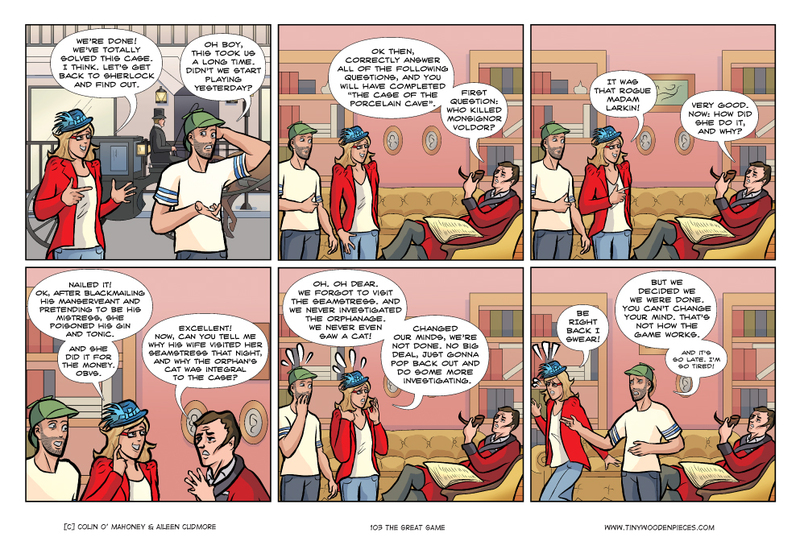 We played case 8 a week and a half ago and did pretty much exactly what the comic showed. 🙂 Usually what we do is draw a line at what point we think we would be able to solve everything and keep exploring, but it was so late already so we just went back thinking we knew all the answers. But no. By midnight we did, though. Waking up for work the next day was painful. But worth it. I reckon if you are playing for points, you are doing it wrong. You can only play it once, so you should get all you can out of each case. Solve every little mystery and visit lots of places. You can stop at a point and say “OK here’s my answers” and see how the points are if you want, but then continue on investigating, I say! Coop games are great like that. They’re just great in general, I think. Definitely one of the most fun ways to game. It’s odd in that there are very few mechanics at play in the game that would allow for something like that. It’s basically: here is the crime, here is a book of addresses and people that you can visit, and a newspaper, now go do whatever you want. Nothing more to it. Almost like a choose your own adventure book. Great fun, though. OK, I have to ask: how on earth did you dog get to be called Madame Larkin? That makes more sense. A little bit more, anyway. I’ve had a copy of The Cure since it’s release, and I have still yet to play it. I arrived home with a copy of the new Pandemic expansion the other day, State of Emergency, only to have my enthusiasm for having that game ruin us all in new and imaginatively unfair ways dashed slightly by my better half; “Another Pandemic expansion? We still haven’t even tried the other two, or Legacy”. I’ve got every Pandemic game there is, and yet continue to only play the vanilla version… I may have a problem. Is there a such thing as too much Pandemic? THERE IS NO SUCH THING AS TOO MUCH PANDEMIC. Having said that, we too have had an expansion for over a year now and only ever played one module of it once. At the risk of sounding hyberbolic, it honestly might be that Pandemic is such a perfect game as it is, and it is already so damn challenging every time we play it. I recommend The Cure for brain dead days. Gives a taste without making you think too much. There have been a lot of those lately, I may have to pop it out this weekend.